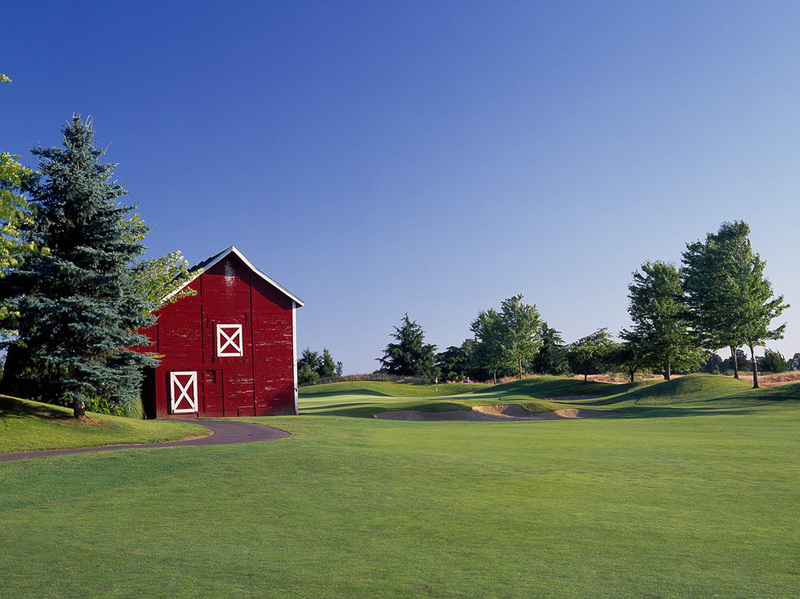 The property, now known as Langdon Farms Golf Club, was originally a working farm of the Langdon family for 63 years. The patriarch, Jame Edgar Langdon, was born and raised in Kansas. His future wife, Marie Beck, was born in Sussbach, Germany, and came to the United States via steamship at age eight. Traveling alone, she arrived at Ellis Island, New York, in 1887 with only a name tag around her neck, and no money. He only doll and her German golf coins had been stolen en route. Shortly thereafter, she joined her parents who resided in Galesburg, Kansas. The Becks and the Langdons were neighbors, and soon James Edgar and Marie became sweethearts. They were married in San Francisco in 1903 and enjoyed 67 years of marriage. James Edgar (J.E.) and Marie initially lived in Eureka, California. Known for his kindness with animals, James Edgar drove a team of horses for the fire department. A runaway team had killed the previous driver, and J.E. tame the horses by throwing away the Spanish bits and using smooth bits as was used on the farm. He also gave the horses cube sugar, and never again had a problem. J.E. was a “gentle giant.” He was a kind, generous, thoughtful man, well-liked, and respected by all. he was also a very large man at 6’4 1/2″ and 240 pounds. President Herbert Hoover once shook his hand on a campaign train stop in Canby, Oregon, and commented that it was the largest had he had ever shaken! Marie and J.E. later moved to Hubbard, Oregon, and then acquired the Aurora farm property from Marie’s father, Newton Beck, in 1931. The original farmhouse and barn were built in 1908 by a man named Piper who made a fortune selling hops. Due to acquisitions over the year, the original 120 acres grew to 360 acres. The Langdon’s had three sons – Homer, Harold and James. Homer never married but lived with his folks, while Jim, his wife Betty and son Jimmy lived in the home on the southern portion of the farm. Homer and Jim actively farmed with their father, raising various crops of flax, wheat, potatoes, and alfalfa. Their livestock included Clydesdale’s, Herefords, milk cows, sheep and chickens. Marie took an active part in making the farm successful. Neighbors, family and farmhands enjoyed her excellent meals and gifts of anything grown in her gardens. She also thoughtfully kept spare gloves under her bed for farmhands who had forgotten their work gloves. In the 1960’s, the State of Oregon needed acreage for the I-5 freeway, the Hubbard Exchange, and later, the northbound rest area. J.E. Langdon did not want to divide the farm but said, “Well, the state needs the property; we won’t fight it, but we will ask for an underpass to access the west acreage.” The farm acreage was reduced to one-half to 184 acres. Shortly thereafter, the two brother, Homer and Him, both died untimely early deaths. The remaining son, Harold and his wife Emma, were living in Cedar Mill, Oregon, so then they took on an active role in caring for Marie and James Edgar, and leased the farm. Marie died at the farm at age 91, and J.E. Langdon lived to almost 102 years of age. Emma Langdon carried on Marie’s tradition of creating a bountiful garden, fruit orchard, and blueberry patch – sharing everything she grew. Harold maintained the farm and continued his interest in rebuilding antique and classic automobiles in the barn. The farm property was sold to a golf course developer in 1994, and the traditional name of Langdon Farms continues the legacy of this well-regarded family. OB Sports Golf Management was the golf course developer that built and opened the public course in the spring of 1995. 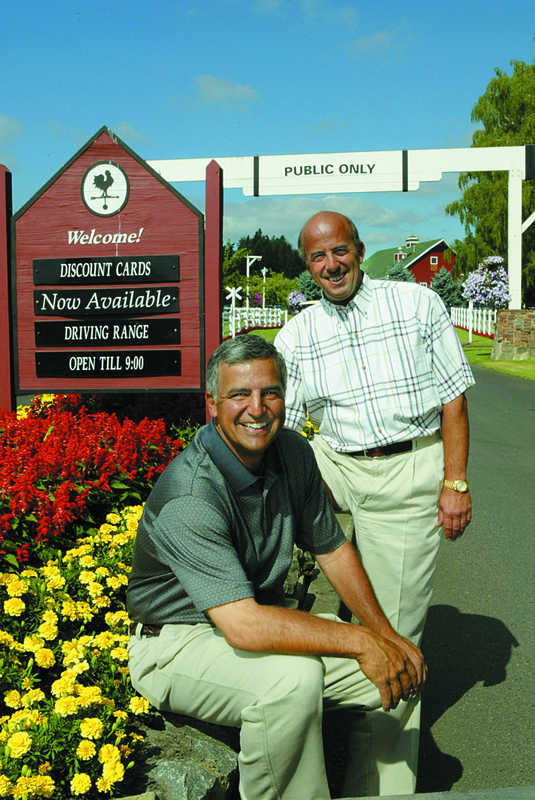 The current owners, brothers Chris and Tom Maletis, were also original investors in the development project. In 2003, the Maletis’ purchased the course outright and operated it as a family business until the end of 2008. In 2009, they hired OB Sports Golf Management to handle the day to day operations on their behalf and that relationship exists today. Langdon Farms Golf Club stands as one of the premiere Portland golf courses today and remain as stated at the entrance, “Public Only.” It hosts annually some of the most prestigious corporate and charity golf tournaments in the Portland metro area. For several years, the course hosted the local US Open qualifier where the lowest all-time score was 67, 4 under par. Langdon Farms Golf Club is also home to the local-favorite, Langdon’s Grill, an american-style family restaurant and bar. It also hosts many weddings, corporate meetings, retirement parties, anniversaries, and school fundraisers in the unique Red Shed event venue. 4.4 stars on Google: ‘I have played this golf course, it is one of the best golf courses in the northwest.’ ~ John J. 4.5 stars on Yelp: ‘Langdon Farms is a great course to play and is always in fine condition unlike most of the public courses around Portland.’ ~ Bobby S.
161 and counting, 5 star reviews on Facebook: ‘This is the best golf course year round in Oregon. Kept better than most private clubs.’ ~ Paul W.